Get good green beans, e.g. from Sweet Maria. For more in depth information about making coffee I recommend Wikipedia's entry on Coffee, Sweet Maria's Coffee Roasting Library and The Coffee And Coffee Makers' Guide (on fantes.com until 2014). If you follow this recipe to the core you will get delicious coffee. Yet, in no way is following even the best recipe a guarantee for good coffee. In fact, a complex thing such as coffee is likely to show you every side of life pretty much always. 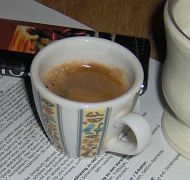 This recipe was first presented by rattus rattus on February 12, 2006, in rattus rattus' blog: Cooking Coffee.